Given the general press cheerleading for the Barclays Center, as well as the New York Times's pattern, in news coverage, of leaning toward the developer's narrative, it's somewhat refreshing to see a more balanced article on the front of the Metropolitan section today, headlined In Brooklyn, Bracing for Hurricane Barclays. In fact, the article implicitly (and belatedly) demolishes the dangerously fanciful formulation that the Times peddled in the fall of 2005, that "the project's seemingly inexorable movement suggests that Mr. [Bruce] Ratner is creating a new and finely detailed modern blueprint for how to nourish - and then harvest - public and community backing for a hugely ambitious development." Today's piece even includes the now-infrequent disclosure that Forest City Ratner "built The New York Times’s headquarters in Midtown Manhattan." At the same time, even this 2,700-word article can't capture some of the nuances in the controversy, and there are both gaps and errors that obscure what I call the Culture of Cheating. 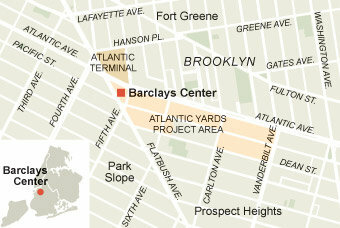 One small but important one: the Barclays Center arena is portrayed as occupying the triangle serving as its plaza. Actually, the arena occupies most of the space between Fifth and Sixth Avenues and Dean Street and Atlantic Avenue (see schematic at top of blog). This isn't the first time the Times has gotten the map wrong. As the sun sets over the Barclays Center arena, a new era is about to begin. The developer says that the 16 towers planned around the arena – almost all residential – will eventually be built in two phases, and the project goals of “Jobs, Housing, Hoops” will be fulfilled. But the goal of "jobs" surely won't be fulfilled in the manner as promised if Forest City build the promised 16 towers using modular construction, which cuts down significantly on wages for labor and, likely, the number of workers. Amid the festivities, though, the arena stands as an island, a reminder of what is missing. The 16 surrounding towers — primarily residential — that were originally planned by the developer, Forest City Ratner Companies, for the 22-acre, $4.9 billion Atlantic Yards project have yet to be built. The 10,000 or so jobs promised have not materialized. Of the 2,250 affordable housing units pledged out of 6,300, only 181 are planned for a first tower, and ground for the building has yet to be broken. In the days before the hip-hop mogul Jay-Z, a part owner of the Nets, inaugurates the arena with a series of concerts, the air tingles with the dust of last-second construction and mixed emotions: excitement and wariness, anger and resignation. The developer says it will build the remainder of the project, though it could take up to 25 years, and not the 10 originally planned. Let's unpack that: in 2005, Forest City agreed to pay $100 million for railyard development rights. In 2009, it renegotiated the deal, with up to 22 years to pay, a gentle 6.5% interest rate, and a smaller replacement railyard. The city and the community would get jobs and housing in exchange for subsidies; the state, would get a new subway terminal and $100 million for rebuilt rail yards; the developer would make a legacy and maybe even a profit on luxury condominiums. Beyond the awkward punctuation, the sentence is confusing. The trade-offs were much broader: the creation of new tax revenues, the removal of blight, and the creation of that mixed-use community. Also, the sequence gets (understandably) compressed. The original plan included four office towers around the arena, said to house 10,000 jobs. And Forest City would make a profit on everything: the arena, the luxury condos (which came later), the subsidized housing, the retail, the office space. That's what they do. Brooklyn would have a major professional team for the first time since the Dodgers left for Los Angeles after the 1957 season. Frank Gehry designed a glass world that would loom over the low-rise neighborhoods of brownstones and housing projects. 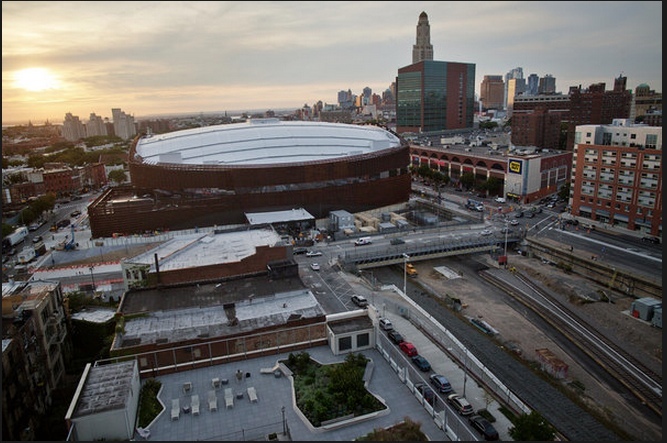 A park on the arena roof would connect to a 60-story office building named Miss Brooklyn that would surpass the Williamsburgh Savings Bank as the tallest building in the borough. The project was billed as a win for all. But opponents emerged at the first news conference in December 2003, handing out cookies shaped like turkeys. 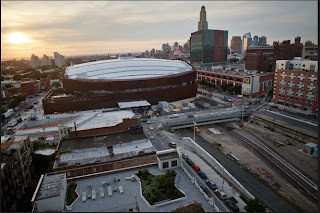 Upset over the project’s scale and the displacement of hundreds of people it would involve, that group evolved into Develop Don’t Destroy Brooklyn, the plan’s most vocal critic, led by Daniel Goldstein, who would later refuse to leave his condominium on the condemned arena land. Actually, it wouldn't have ever been a park on the arena roof, just park-like publicly accessible open space, privately managed. Also, there was a broader concern beyond scale and displacement: a lack of democratic planning and an inside track for a single developer. Forest City conducted an aggressive public relations campaign with the slogan “Jobs, Housing, Hoops,” hoping to use that platform to secure support from community organizers, public-housing residents and Brooklyn’s influential black clergy. In June 2005, it signed a “Community Benefits Agreement” [CBA] with eight nonprofit organizations, establishing obligations of housing and hiring, and vowing to create amenities like a health care center, a meditation room, a school and eight acres of open space. The deal, lacking city authority, had inherent conflicts; three of the signatories got financing from Forest City. This is the first time the Times has aired such criticisms of the CBA, but even this is soft-pedaled. In 2009, Forest City acknowledged "funding obligations and commitments to each of the organizations." An independent compliance monitor was supposed to determine if the company hit its targets. If not, it would pay $500,000 to be used by the lead signatory, Brooklyn United for Innovative Local Development, or Build, a job-training group that, financed by Forest City, operates out of MetroTech. The monitor has yet to be hired. This is the first time the Times has reported on the failure to hire an Independent Compliance Monitor, another inherent flaw in the CBA. But the $500,000 does not apply to all the obligations in the CBA--imagine if Forest City could exit its affordable housing obligation--but only the job-training obligation. The article quotes the Rev. Herbert Daughtry, whose Downtown Brooklyn Neighborhood Alliance was formed "with $50,000 in seed money from Forest City" (but no mention of the other, regular funding) regarding his decision to get on the train leaving the station. And the Rev. Clinton Miller of Brown Memorial Baptist Church in Clinton Hill adds nuance by explaining how Forest City divided the community by race and how, while he wants the process "to be fair and inclusive,” he didn't join lawsuits opposing the project. Forest City never clearly announced the number of jobs it would deliver. Instead, politicians like Senator Charles E. Schumer proclaimed the creation of 10,000 jobs in 2004 at the state of Brooklyn address. That's not true at all. In the developer's initial p.r. packet (see p. 5), Forest City announced more than 10,000 office jobs and 15,000 construction jobs. That promise was echoed in promotional fliers, such as this one from 2004. The 2006 environmental impact study done by the state agency overseeing the project, the Empire State Development Corporation, projected Atlantic Yards would generate 8,560 permanent jobs and 16,924 construction jobs. That's a little complicated. Actually, the state agency offered projections for both a commercial and residential variation of the project. 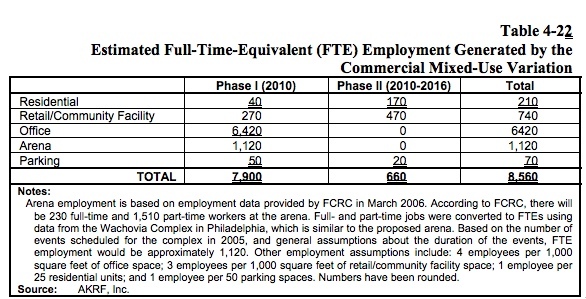 The number 8,560 permanent job derives from the long-abandoned commercial version; note that Forest City has long planned three residential towers around the arena. A Forest City spokesman, Joe DePlasco, said that an average of 841 workers per day were on site over the past year, and that more construction jobs would come in the full build-out of the residential towers, though he declined to be specific. An office tower that would have supplied thousands of jobs has been delayed. Note that the office tower is the home to the plurality of jobs in the residential mixed-use variation. DePlasco declined to be specific likely because the plans are still vague and the numbers of workers significantly less. 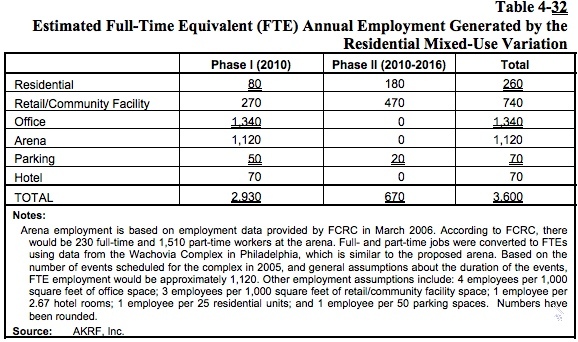 This spring, Forest City sponsored job fairs for Brooklyn residents that drew more than 35,000 people — for 2,000 arena jobs, 1,900 of which were part time. Build, the job-training organization connected to Forest City, enrolled just 36 participants in an unpaid internship program, promising them construction jobs and union cards. Only two participants received union cards. Seven participants, however, filed a lawsuit in 2011 against Build and Forest City Ratner, claiming they had been misled. An appeal by Forest City was denied in June. This deserved more space: the point of the training program was to be transformative, to offer careers rather than part-time jobs without benefits. According to its agreement with Empire State Development, Forest City has until May 2013 to begin work on the first residential tower or pay a $5 million penalty. Mr. Ratner said the ground-breaking would be on Dec. 18. Forest City wants to use modular construction for that 32-story tower to reduce costs. While 50 percent of the units will be affordable, the developer made a subtle switch: adding more one-bedroom and studio apartments than the two-bedrooms it was supposed to build. City subsidies are paid per unit, not per bedroom, allowing the company to build smaller units while getting the same financing. “The first building is not going to be the perfect building, but unless we start building, we are never going to get where we want to go,” said Bertha Lewis, the former head of Acorn, who is still involved in the process. Note that Lewis, in public comments, blamed opponents, not Ratner, for the delay, and made no mention about how the additional family-size units couldn't serve her constituency. But opponents wonder if Forest City will be able to finance the other 11 residential towers planned for Phase 2, which it must complete by 2035. (Forest City negotiated to pay the $100 million it owes the Metropolitan Transportation Authority for the rail yards in installments through 2031.) The company lost an appeal in court and must submit a new environmental impact study for the project. It shouldn't be simply "opponents" who wonder. Surely some supporters and allies wonder. Beyond the concerns I noted above about the timetable, note that Forest City does not "submit" a new environmental impact study; that's the job of Empire State Development. Then again, that may be the practical description, given that Forest City ultimately must pay for the study, and it will be conducted by AKRF, which worked for the developer on Atlantic Yards before it worked for the state. THOSE “in the footprint” are left waiting for the approaching storm. Note that this is a perhaps more common but rather odd formulation, because the "footprint" has mainly (though not exclusively) been used to describe the 22-acre project site, not the more nebulous zone of impact. In the past year, the state liquor board has granted about 40 liquor licenses to establishments near the arena, and Barclays Center’s four premium bars, with a combined maximum capacity of 1,800, will serve alcohol up to an hour after events, with last call at 1 a.m. Missing: arena operators neglected to inform the Community Boards of this plan, and that they initially wanted a last call of 2 am. At a meeting in early September, residents expressed concern about alcohol use by arena patrons. The new police precinct commander, Capt. Michael Ameri, tried to dismiss their fears. “These are very wealthy people,” he said, and many in the crowd of about 50 gasped at his equation of money and decorum. Regina Cahill, who lives about 400 feet from the arena and is a board member of the North Flatbush Area Business Improvement District, preached caution. “I feel very strongly that it is unfair to characterize every patron of the arena as an uncivilized outsider, a driver ‘under the influence’ looking to loiter and destroy our quality of life,” she said. Sure, it's unfair to make that characterization. But it's not unfair to wonder whether some fraction will do so. And the margin for error is small. Parking looms as the other specter. This spring, the state cut parking spaces at the arena’s lot two blocks away by half, to 550, and residents fear that rather than promoting the use of public transportation, the move will just increase the number of drivers trolling for street parking. More complicated: the promised seamless, pre-paid parking didn't work for month. At least the article notes that Forest City has played it coy regarding residential-permit parking that many neighbors think is needed to deter drivers seeking free parking.